K.T. Naveen Kumar has claimed that Mohan Gowda, the Karnataka spokesperson of the Hindu Janajagruti Samiti, put him in touch with a Sanatan Sanstha activist during the planning stages of the crime. 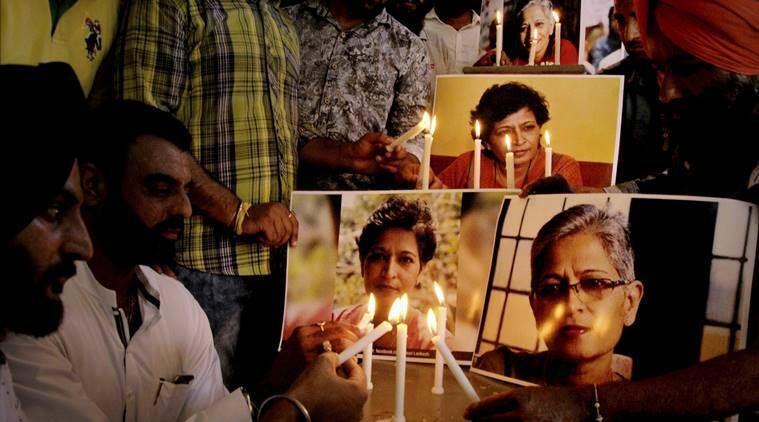 New Delhi: The ongoing probe into the September 2017 murder of journalist-activist Gauri Lankesh has revealed yet another link to the extremist Hindutva group Sanatan Sanstha and its affiliate Hindu Janajagruti Samiti (HJS). According to an Indian Express report, Mohan Gowda, Karnataka’s HJS spokesperson, put K.T. Naveen Kumar, the key accused in the case, in touch with the Sanatan Sanstha unit during the planning phase of the Lankesh murder. Naveen Kumar, an activist of the Hindu Yuva Sena, was arrested in March 2018 and four of his associates taken into custody last week for the murder of Lankesh and plotting to kill Kannada writer K.S. Bhagwan. Gowda, according to the Indian Express, had knowledge about the existence of an “extremist unit” in the parent organisation. Based on a voluntary statement by Naveen Kumar, Gowda allegedly connected him last year to Sujeet Kumar alias Praveen, a 37-year-old Udupi resident, who was among the four arrested on May 31. The others arrested are Amol Kale alias Bhaisab (39) an activist of the HJS from Maharashtra, Amit Degwekar alias Pradeep (39) a Sanatan Sanstha activist and resident of Goa and Manohar Edave (28) a resident of Vijayapura in Karnataka. In his statement, Naveen Kumar made a reference to an annual convention of the Sanstha he attended in Goa’s Ponda in June 2017, where he spoke about the necessity of using weapons and arms for the protection of Hindu dharma. “Impressed by my speech, many people congratulated me. Mohan Gowda praised me a lot. I told him I can procure guns and bullets. He told me there were many like-minded people and they would be contacting me in the coming days,” he claims. Following the convention, Naveen Kumar claims he was put in touch with one Praveen and asked to “carry on working” with him. Praveen, as per the written statement, visited Naveen Kumar and and his wife soon after and collected some bullets that were in his possession to verify whether “they could be useful’’. Soon after, he told Naveen Kumar that he needed assistance to kill Lankesh. “He told me Gauri Lankesh had been speaking in an insulting manner about Hindus and Hindu Gods, and that they had decided to kill her,’’ Kumar claims, adding that he then travelled to the Sanstha ashram in Mangalore on the invitation of a local HJS leader on September 5 last year and learnt the next day from reports that Lankesh had been killed. The Wire had earlier reported how Gowda when questioned about the men’s links to the HJS, he had claimed that some of the men involved “may have attended HJS programmes”.